German women wish in the main to be wives and mothers, they do not wish to be comrades, as the Red philanthropists try to convince themselves and women. They have no longing for the factory, no longing for the office, and no longing for Parliament. A cosy home, a loved husband, and a multitude of happy children are closer to their hearts. Starting in 1933, German policy aimed to stuff the (for the time) emancipated women in of the 1920s back into a role that was both traditional and, in its own way, revolutionary. She was to spend her life producing offspring, not merely out of a desire for children or duty to her family, but also for her race and her Fuehrer. If in the past the liberal-intellectual women’s movements contained in their programmes many, many points arising out of the so-called “mind”, then the programme of our National Socialist women’s movement really only contains one single point and that point is: the child. We alone are entitled to lead the people as such — the individual man, the individual woman. We regulate relations between the sexes. We mould the child! The reason? Because, as Hitler later said in the same speech, children “belong to their mothers as at the same moment they belong to me“. Elsewhere, Hitler compared childless women with deserters from the battlefield for their refusal to support Germany in the racial struggle. In addition to her family background, her outward appearance, and the great number of her children, she had an imperturbable attachment to the person of the Fuhrer that went hand in hand with a simple, literal, ideological seriousness open to every intellectual claim, no matter how unreasonable. Her correspondence with her husband, part of which has now been published, makes absolutely clear the basic psychological pattern of this type of woman: the yearning for subjection and self-surrender that lacks neither the features of personal unselfishness nor the shrill tones of hysterical faith; the blatant prejudices and the ability to fit all obviously contradictory facts into her philosophy without any intellectual embarrassment, to canonize stupidities, and to surrender blissfully to the densest obscurity. To promote this new woman and this new vision of marriage, the Nazis instituted a variety of policies, including marriage loans, tax incentives for large families, public honors for women who produced large numbers of children for the state, tax penalties for childless couples, and severe punishment for abortions (among Aryans, anyway). Also, after 1935, all aspirants to German marriage were required to submit genealogical records and medical histories to determine racial and medical fitness for marriage, because it wouldn’t do to allow people to marry and produce sub-optimal Aryan children. 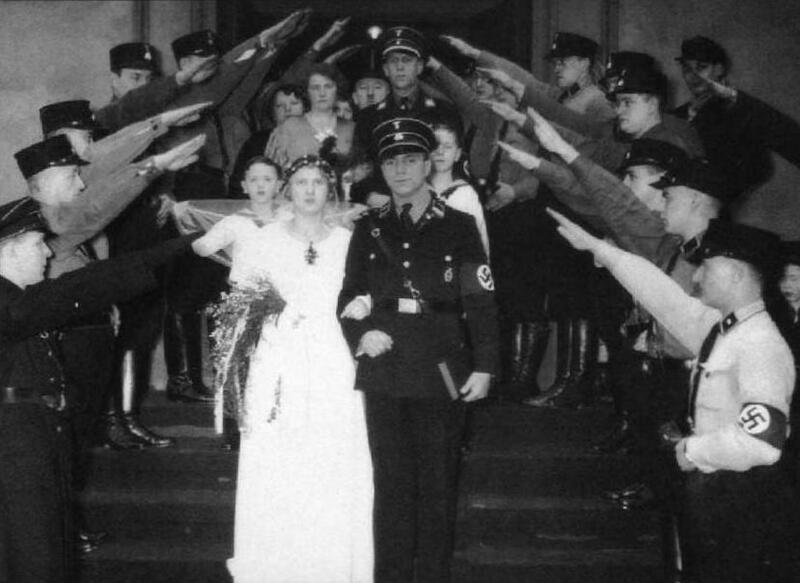 Of course, not all marriages were created equal in the Third Reich. Marriages between Jews and Germans were banned in 1935 by the Law of Protection of German Blood and German Honor (a part of the infamous Nuremberg Laws). Under Section 1 of this law, no marriage between a German and a Jew was legal, even if it was concluded abroad. Under Section 2, sexual relations between Germans and Jews were outlawed. For several months, the Nazis dithered over the enforcement of this law, primarily because of the difficulty in coming to agreement on who could be defined as Jewish. Most Jews in Germany had long ago assimilated, leaving few obvious markers. Arguments tended to hinge on questions like whether including half-Jews in the ban meant that the Nazis were abandoning valuable Aryan blood or whether the half-Jew was too dangerous to exclude because his Aryan characteristics would make him a more dangerous opponent than a full blooded Jew. Difficult as it is to imagine educated adults spending weeks kicking issues like this around, that is how Interior and Health Ministry types like Gehard Wagner and Wilhelm Stuckart occupied the first months of 1936. This law did not nullify marriages already concluded; mixed marriages were grandfathered in. They were called “privileged mixed marriages”, which afforded the Jewish spouse a measure of protection against discriminatory laws. The reason for Hitler’s “generosity” on this point was political. A half-Jew, or mischling, presumably had a large Aryan side of his family who would object to Nazi policies against him. Evidently, Hitler decided that such objections would give him more trouble than he wanted, so he would bide his time until the population of mischlings shrank and fewer people would agitate for their rights. Professional women–doctors, lawyers, and teachers particularly–were pushed from their jobs within the first months of Nazi rule, often to make room for men of a more ideologically dependable character. Women were not allowed to hold leadership positions within the party or state, except for those areas, like the League of German Girls, already reserved for women. Girls were discouraged from pursuing higher education. Those who tried it anyway found themselves steered into home economics courses, which made it nearly impossible for them to move on to a life in academia. A few professional women still managed to keep their jobs and achieve, but only because their contributions pleased the top leadership of the Nazi party. Examples of this include Leni Riefenstahl (movie director), Hannah Reitsch (aviatrix), and Winifred Wagner (director of the Bayreuth Festival). But mostly, if they stayed in Germany, women had to either find menial work or marry men who could serve as breadwinners. Such was marriage in the Third Reich. The Nazis wedded the traditional, conservative family relationship to the Nazis’ strange notions of racial struggle to produce a marriage culture that greatly restricted the lives of German women and served as the stage on which Nazi ideas of ethnic purity would play out during the 1930s.